Have you heard of Bulu Box? This subscription box offers health, nutrition and weight loss products that are right for you! It's easy to get started with Bulu Box, simply chose which box you'd like - The Original or The Weight Loss. 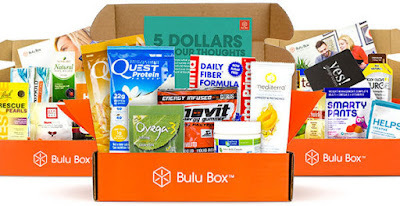 Each box contains 4 to 5 premium samples, plus a lifestyle bonus item, once you've chosen your box, then chose how often you'd like to receive a Bulu Box. They have a month-to-month option or a 3, 6, 12 month option, each subscription comes with free shipping. Once you've received your first Bulu Box, be sure to try out all your samples - this is a great way to try out new products before purchasing them full size. Earn points with Bulu Box, just log into your account and share your thoughts on your recent box - each month you can earn up to 100 points! Once you've earned reward points you can cash them out, apply them to your next Bulu Box or apply them towards full size products. In my first Bulu Box I received samples of Dermis8 Exfoliating Soap, Pocket Protein, Jelly Belly Sport Beans, ZAMboost, Manitoba Harvest HempPro 70, and Tiger Balm Ultra Strength Pain Relieving Ointment. I was really excited to try out all of my new samples, the ZAMboost is perfect for this time of year, it helps protect your immune system! I love the Pocket Protein, it's the perfect size to toss in my purse and it contains 15g of muscle-building protein with out fat, sugar, carbs or gluten! Speaking of protein, the Manitoba Harvest HempPro 70 in vanilla is amazing, it's a plant based protein and contains 20g of protein- it's the perfect morning drink! If you've got a game day ahead of you, then you need the Jelly Belly Sport Beans! Each Sport Bean is loaded with carbs for fuel and electrolytes to help maintain fluid balance, plus it has vitamins and they taste great! After a work out or a game of softball, the Tiger Balm Ultra Strength Pain Reliving Ointment will give you fast, warm and comforting relief for joint and muscle pain. My last sample was a lifestyle bonus, the Dermis8 Exfoliating Soap moisturizes and exfoliates, it contains eight natural ingredients that help even out and brighten your skin tone! It also prevents clogged pores by removing dead skin and naturally hydrating skin cells for healthier, smoother skin all over. Be sure to stay connected with Bulu Box on Facebook and Twitter!